‘Cabinet’ miniatures were so-called as they were intended for display within a room rather than to be carried about the person as smaller portrait miniatures usually were. This example shows a pretty young lady with clasped hands. 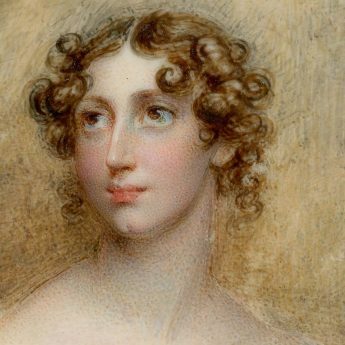 She has light brown curls, soulful eyes, and a dimpled chin and is wearing a décolleté white dress with a jewelled waistband and short buttoned sleeves. She is portrayed in front of a classical stone column. The portrait is set in an impressive and heavy brass frame decorated with cupids and garlands of flowers. Both the frame and the painting are in excellent condition. The daughter of a London portrait artist, Anne Foldsone (ca. 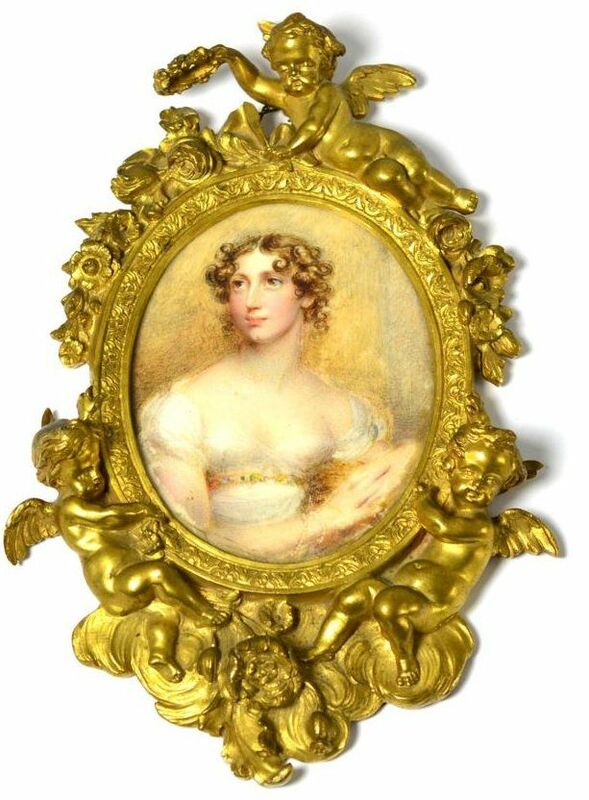 1770-1851) assisted her father in his studio from an early age but it was her father’s unexpected death that led her to forge a career in miniature painting in order to support her mother and numerous siblings. 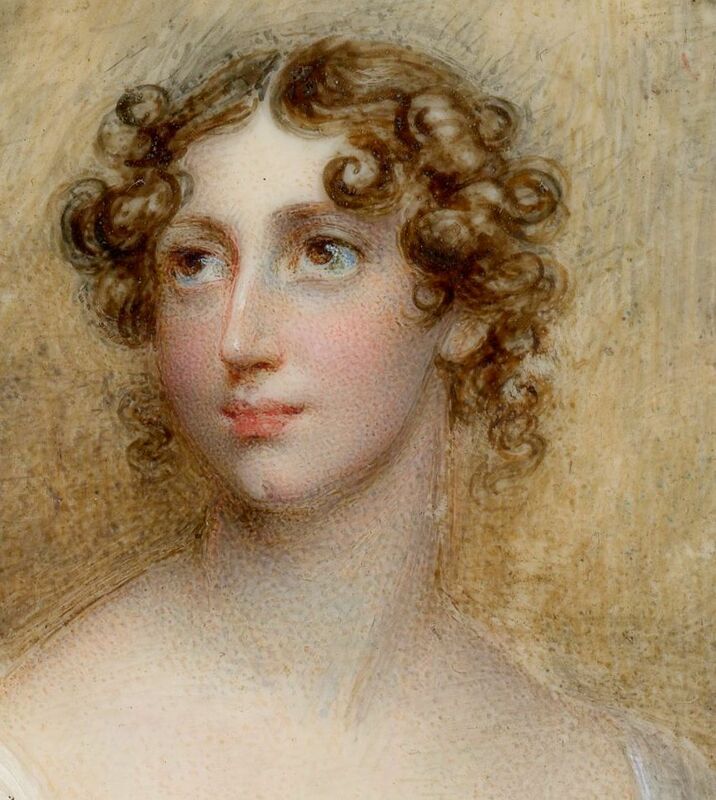 Throughout her career she enjoyed Royal patronage culminating in a commission from the Prince Regent, later George IV, to paint an ambitious series of portraits of the most beautiful society ladies of the day. Following her marriage to an Irish barrister, Mrs Mee had six children. She continued to paint though her husband only ‘consented to let her paint ladies only who were never to be attended [at the sittings] by gentlemen’. She exhibited at the Royal Academy between 1804 and 1837; further examples of her work can be viewed at the V. & A. Museum in London. Size: 102 x 80mm (4 x 3⅛") ; framed, 215 x 142mm (8½ x 5⅝") max.